Episode 076: What’s the best business structure for adding associates to a practice? 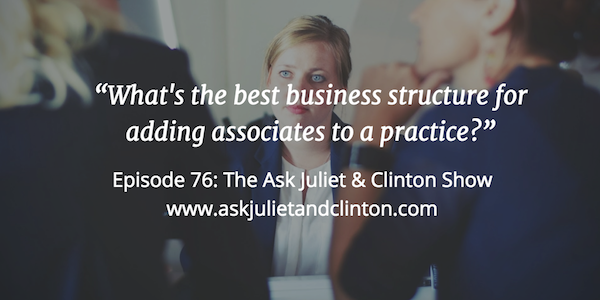 In this episode, Juliet and Clinton answer questions about the best business structure for adding associates to a practice, what content to put in a flyer, and the best way to respond to a potential client who contacts via email. Episode 075: Is it Worth Using Facebook Ads to Increase Page Likes? 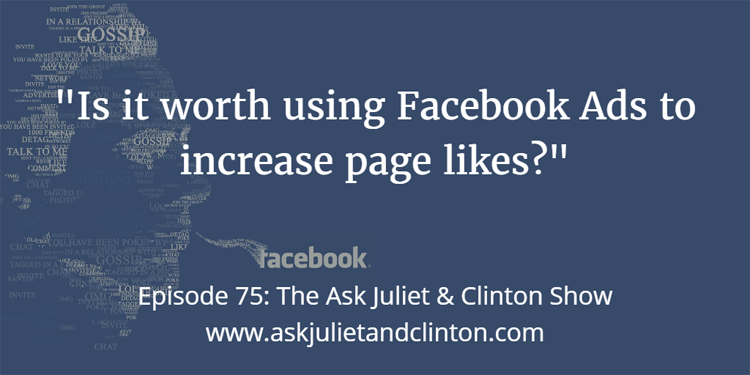 In this episode, Juliet and Clinton answer questions on the theme of Facebook Advertising including whether it is worth using Facebook Ads to increase page likes, how to use Facebook Ads to fill a workshop, and how to use Facebook Ads to get more email subscribers. 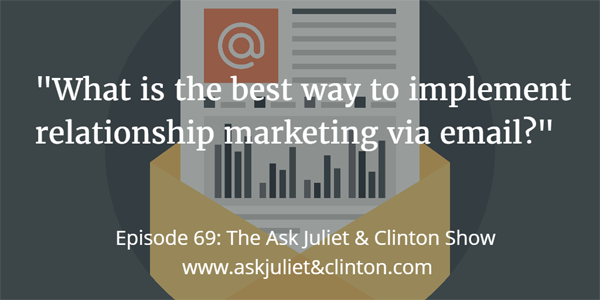 Episode 069: What is the best way to implement relationship marketing via email? 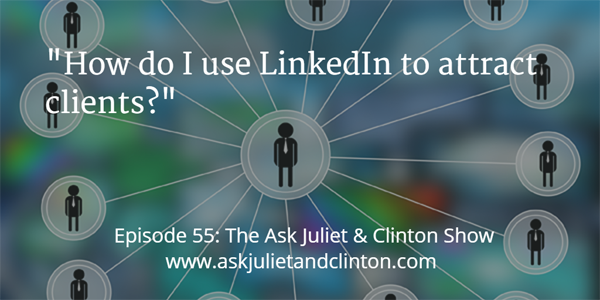 In episode 69, Juliet & Clinton created 3 questions on the theme of relationship building. The questions were: 1) How to implement relationship marketing via email? 2) How to implement relationship marketing via Twitter? And, 3) How to implement relationship marketing via Facebook? 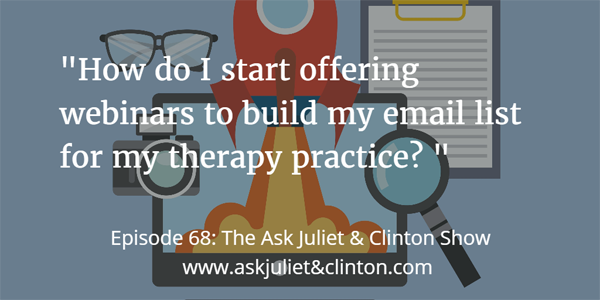 Episode 068: How do I start offering webinars to build my email list for my therapy practice? In episode 68 Juliet and Clinton answered questions about how to begin offering webinars, how to write in a way to attract your ideal therapy clients, and how to create and use Twitter lists as a therapist. 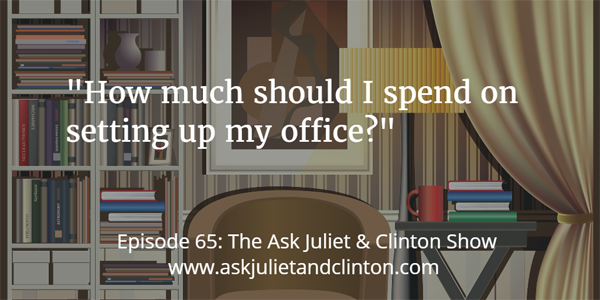 Episode 065: How much should I spend on setting up my office? 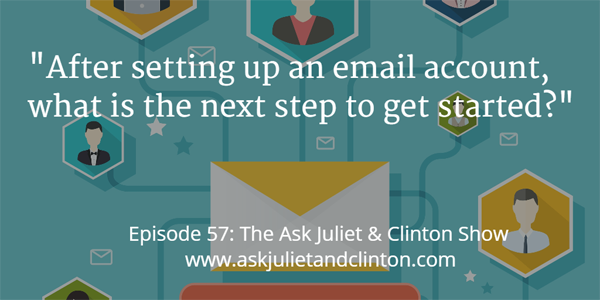 In episode 65, Juliet and Clinton answer questions about how use webinars to build an email list, whether it is better to publish an ebook or a print book, and how to turn a workshop into a paid online course. 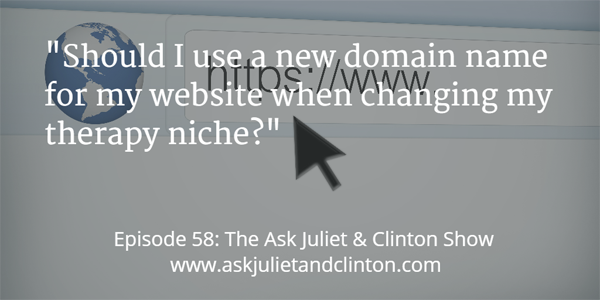 In episode 58 Juliet and Clinton discuss whether one should create a new domain name for a website when changing their therapy niche, how to create a introductory video, and how to promote counseling services and products to an email list. In this episode Juliet and Clinton discuss how to use LinkedIn to attract therapy clients, how therapists can manage a private practice, market consistently and create products to sell all at the same time, and how to get more people to subscribe to an email list. Episode 050: How do I change the name of my therapy Facebook page? 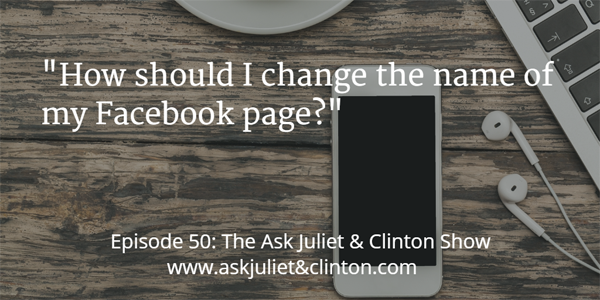 In this episode, Juliet and Clinton discuss and how one should go about changing the name of their therapy Facebook page. They also provide tips for creating a marketing plan and define email list segmentation and explain how do it. 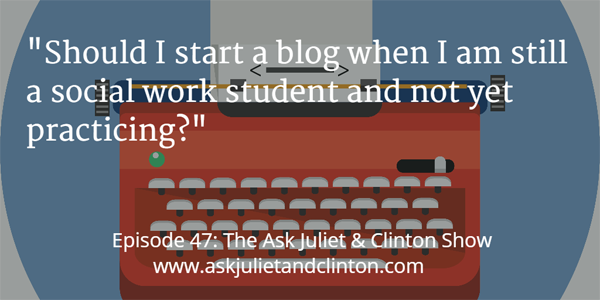 Episode 047: Should I start a blog when I am still a social work student and not yet practicing?